With a relatively short production life (1983-87) the FT-1 is not that well known. Here's a workaday camera that has slipped through the cult-camera drag net. I've searched the web and can you can find more owners raving (or raving owners) about their Lomos than you can find even references to the FT-1. The FT-1 was actually a slightly improved version of the FS-1, which is a landmark camera as it was the first commercially available SLR with a built-in motor wind. This might not seem like a big deal but in an era when add-on winders were large, loud and heavy it was a quiet revolution ... literally. The FS-1 did have a bit of a reputation for unreliable electronics. This issue was addressed by the FT-1 as well as a couple of small improvements which made the FT-1 a better machine. 20 years later you're likely to find an FT-1 for very little money, functioning as well as the day it left the factory. Here's a camera from that strange cross-over period in the 80's when the old manual, metal and mechanical cameras were having more sophisticated electronics added to them. Auto-exposure settings became common-place as manufacturers attempted to make their cameras easier to use. Shutters were now governed by electronics and would not function without batteries. Auto-focus and even film DX-coding were still a couple of years away but the motor wind had been miniaturized enough to fit inside the camera's body. The camera's body is still metal (plastic bodies were just around the corner) so the FT-1 has a nice heft an feels solid in your hands. Perhaps it is because of this solid construction that the motor wind is remarkably quiet. Plastic bodies tend to act like hollow, sounding boards to what is going on inside them but the FT-1 is pretty discrete for a camera with a motor film advance. It does feel strange, however, to hold a metal camera that feels like a typical 80's metal SLR but doesn't have a manual film advance; after taking a shot my right thumb instinctive reaches for a film advance that isn't there. One of the nicest features of the FT-1, to my mind at least, is its feather light shutter. It is utterly predictable, has the perfect amount of travel and yet requires the minimum of effort to trip. One unusual feature of the FT-1 is that you could buy an accessory shutter release that plugs into the left hand side of the body; with it's motor wind and available left-hand shutter it must have been the most ambidextrous camera of its day. A disadvantage of the electronic shutter release design of the FT-1 is that it does not take a standard cable release but uses a proprietary electronic switch release that you had to buy separately; definitely, a precursor of things to come. These days that release can be hard to locate and I've seen them go for more than a decent FT-1 camera body on eBay. Luckily, the FT-1 I picked up from CraigsList in April of 2005 came complete with its remote shutter release. It also came with the relatively rare 35-70mm f3.5 Konica Hexanon standard zoom, the 'dedicated' flash and a decent tripod, for $40. Everything worked fine without any intervention on my part although there was a little cosmetic damage to the battery case. The FT-1 came in both chrome and black finishes; my example is in the slightly more desirable 'pro' black finish. Still, you could pick up a working example from eBay with a lens or two for less than a hundred dollars without trying. In use the FT-1 is competent, if a little uninspiring. 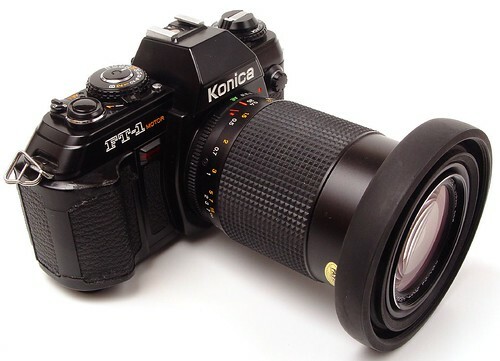 I have read elsewhere that this was the last model Konica aimed at the professional market; although I can't back this up with any real world statistics, I didn't see any pros carrying the FT-1 in its day and nowadays I haven't seen anyone carrying one at all in years. Not that this is a camera that you should be embarrassed to be seen with. Hexanon glass seems on a par with equivalent Pentax SMC lenses. The subtle sound of the motor wind that drew ew's and ah's from gadget, photo-junkies at it's launch is now the standard sound of a 35mm SLR and attracts little attention on the street. Still, the sound would make this camera a liability at a venue where discretion and silence are required (theatre and film still work, wedding ceremonies etc.). The viewfinder is bright and clear although lacking shutter speed information. The controls are simple enough to use after you have spent a short amount of time getting aquatinted with the user manual. In short, this is not a camera I would go out of my way to hunt out, however, it is the kind of gem a friend or relative may find discarded in the back of a closet or you may find disgustingly cheap at a camera fair. If a FT-1 does fall into you lap it don't look a gift horse in the mouth. The FT-1 makes a decent second or third camera to leave in your car or at the office in case the desire to shoot off some film hits you when your beloved, primary system is not close at hand. Because the FT-1 takes ubiquitous AAA or AA batteries rather than any mercury and/or outlawed button cells, if you come back to this camera even after a year or more or storage the FT-1 is likely to fire up and get to work without any complaints. I FOUND THIS CAMERA IN AN ATTIC OF A HOUSE I JUST BOUGHT. IT LOOKS TO BE IN VERY GOOD SHAPE. SHOULD I KEEP IT OR TRY TO SELL IT. IF I SELL IT WHAT WOULD BE ASKING PRICE FOR THE CAMERA AND 3 CHANGEABLE LENSES WITH A FLASH? I have one of these (given as a gift) from the mid-80's. It worked great until recently when the shutter release button (?) quit working. I took it to the local national camera chain and thier advice was to replace it a digital unit. Unfortunatly,I was hoping I could pass this one along to my son that is taking photography this year. Do you know anywhere I can turn to get this one repaired? There are some memories involved as well as I think this is still a great camera. My husband bought me an FT1 in 1984 and I love it. The problem, as Kens, is my shutter release button went at 1998, and I have had no luck since that time to find anyone willing to try to fix it, because it did become obsolete. I have so many filters and lens and no camera. It truly was the best camera I have ever owned or used. If anyone wants to sell theirs, I am interested. If you decide to sell this camera let me know. I am looking for a FT1. Please Help! I have a Konica FT-1 motor. I have a problem with shutter release. The battery is working, The film can be load. Everything working. Just the shutter release is the problem. When I push it, nothing happen. Do you know if I can repair that by myself !? Don - Much to my wife's annoyance I have never sold a camera; I've only bought them. Good luck finding one. George - I have never cracked this one open so I can't help you, however, someone at the classic camera repair forum will have and will be able to help you so drop by and ask your question there - http://www.kyphoto.com/cgi-bin/forum/discus.cgi - good luck repairing it.